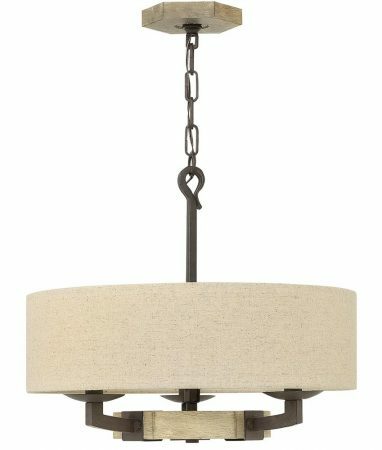 This Hinkley Wyatt 3 light ceiling pendant in solid wood and iron rust finish is rustic and features a hexagonal cartwheel frame, forged metalwork and outer shade. Wood trimmed metal ceiling mount and chain suspension attached to a forged metal rod. Three candle style lights attach to the outer cartwheel frame and sit inside a hardback oatmeal fabric lamp shade. The Wyatt reinvents a classic style. Its refined rustic silhouette reinterprets the wagon wheel in a solid wood hexagon ring tailored with modern sensibility. Deluxe details, such as textured metal brackets and candle sleeves, a wood-trimmed canopy and forged hooks enrich its luxe lodge appeal. Perfect for the bedroom, dining room, hallway or living room. Supplied with 152cm of chain that can be shortened at the time of installation to achieve the desired drop; please see below for dimensions. There are coordinated fittings available in the Wyatt collection that includes six and eight-light chandeliers and a wall light; please see below. This rustic ceiling light is supplied by Elstead Lighting and designed in the USA by Hinkley, founded in 1922 in Cleveland, Ohio. They have transformed from a small outdoor lantern company to a global brand intent on bringing you the best in style, quality and value designs like the Wyatt 3 light ceiling pendant in solid wood and iron rust finish featured here.